Federal Member for Pearce, Christian Porter, has welcomed new laws giving older Australians in Pearce a better deal in retirement. From 1 July, The Retirement Incomes Bill 2018 will make a number of changes which will afford local retirees more financial options in retirement. The Pension Work Bonus – the amount that can be earned from work without affecting eligibility for the Age Pension – will rise from $250 to $300 a fortnight, giving 90,000 people across Australia an increase in their payments. Australians of retirement age who choose to work will be able to keep more of their pension. Self-employed pensioners will also qualify for the Work Bonus for the first time. Some 1,150 more people will become eligible for a social security pension for the first time. Mr Porter said the new laws also expand the Pension Loans Scheme, giving more people the option of borrowing against the value of their home to draw down fortnightly payments from Centrelink. “The expanded Pension Loans Scheme will give people a higher standard of living in retirement by providing them additional fortnightly payments in the form of a loan, conveniently paid into their accounts by Centrelink,” Mr Porter said. The combination of a pension payment and a loan payment can be up to 150 per cent of the full pension, or $1,374.45 a fortnight for a single person of pension age. “Importantly, any eligible Australian of pension age who owns a home can participate in the Pension Loans Scheme regardless of whether they would otherwise be eligible for a full pension, part pension or no pension,” Mr Porter said. 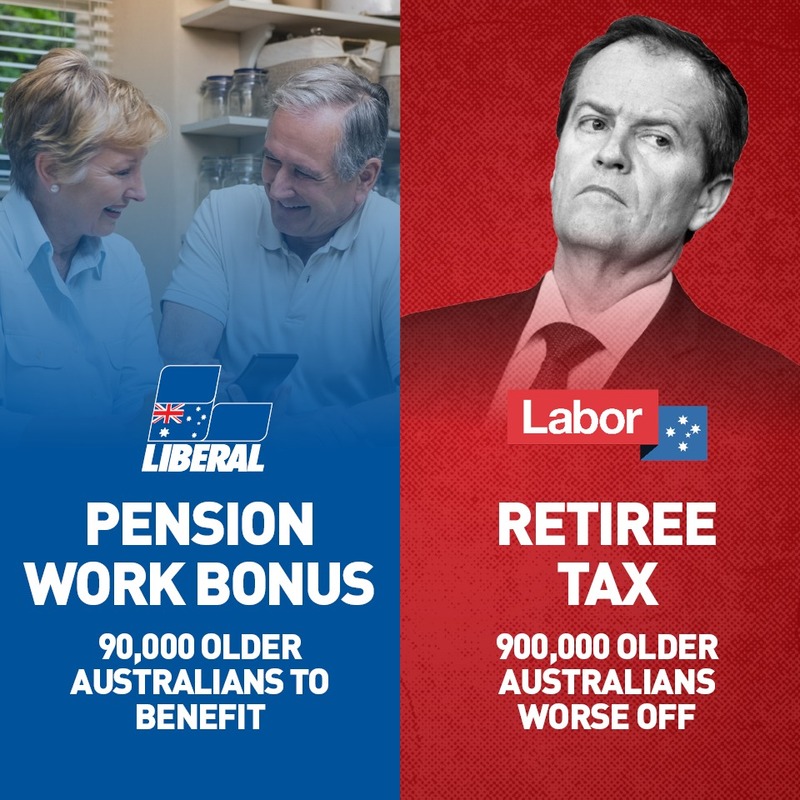 “The Liberal Government is helping retirees while Labor is hitting them with new taxes. “Under Labor’s retiree tax, retirees stand to lose thousands of dollars from their nest egg. “Around 900,000 Australians, 200,000 self-managed super funds and 2,000 super funds will be hit. “On average, individuals will lose $2,200 a year and self-managed super funds will lose $12,000 a year. For many, the losses will be much higher. The new legislation has also changed the means test to assess newer financial products, including pooled lifetime retirement income streams. “The new rules will make sure that these products are fairly and consistently assessed,” Mr Porter said.